NAVITEL® releases a major software update for GPS navigators running on Windows CE. 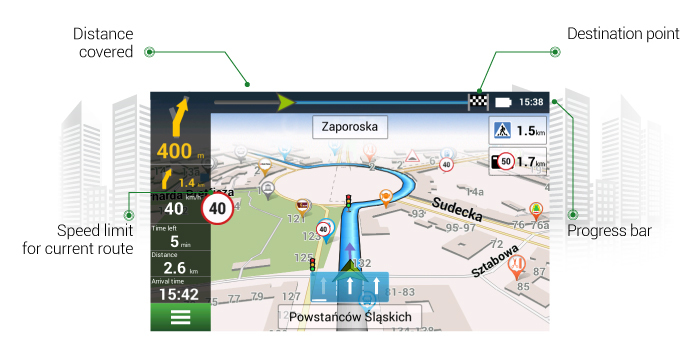 Users can discover a new intelligent notification system, which signals when the car is approaching speed cameras, high-risk road sections and service points in the updated version of Navitel Navigator. It contains an extensive list of traffic enforcement cameras (14 types), potentially risky zones (9 types) and service stations (7 types). The program indicates the distance left to the closest driving regulations in the right side of the display. When the vehicle is approaching them the program starts the countdown to the closest camera, hazardous area or service point. The large-scale revision of the interface helps to warn the driver not only about the type of traffic enforcement cameras on the way but also draw attention to its positioning (same direction traffic lane or opposing one), current and recommended speed and provides other useful information. Well-marked notifications of Navitel Navigator will assist the driver to perform a safe and timely deceleration, lane change or get ready for service points and high-risk road sections (such as zebra crosswalks, dangerous speed limit change, risky road bend etc.). Speed (A fixed speed camera). Used to detect the speed of vehicles. Lane for public transport (A fixed road marking camera for prevention of driving within public transport lanes). Used to detect vehicles moving within lanes consigned to public transport (such as buses, trolleybuses, trams etc.). Lane for taxi (A fixed road marking camera for prevention of driving within taxi lanes). Used to detect vehicles moving within lanes consigned to taxis. Lane for bicycle (A fixed road marking camera for prevention of driving within cycle lanes). Used to detect vehicles moving within lanes consigned to bicycles. Traffic on the roadside (A fixed road marking camera for prevention of driving on roadsides). Used to detect vehicles moving on emergency stopping lanes or roadsides. Stop lines (A fixed stop line camera). Solid marking line (A fixed solid marking line camera). Used to detect lane change violations, such as solid marking line or traffic island crossing. Also used to detect vehicle positioning within a lane when performing a manoeuvre (car spin, U-turn). Red light (A fixed red lights camera). Free intersection (A fixed intersection camera for prevention of stops on an intersection in cases of traffic jams). Used to detect stops within intersections, where stopping is prohibited by special marking and/or road signs. Driving within such intersections is prohibited unless free passage is possible. Seat belts (A fixed seat belts camera). Parking rules (A fixed parking regulations camera). Use of headlights (A fixed headlights regulations camera). No mobile phone (A fixed camera detecting mobile phone use violations – failure to use loudspeaker systems). No trucks (A fixed camera detecting violations when entering areas with prohibition of freight vehicles). Mobile camera (A mobile road traffic camera). Refers to locations of patrol cars, mobile speed cameras etc. Restricted for trucks (Restricted access for freight vehicles). In contrast to the camera detecting freight vehicles prohibition violations, this camera type controls the markings restricting freight vehicles navigation (in case of admittance restrictions without a pass, legal permit etc.). Speed limit is displayed next to the current car speed, right in the centre of navigation menu. The program will notify the driver in case of any traffic violations – orange colour block for up to 10 km/h overspeeding, the red one for over 10 km/h overspeeding*. *Default settings are fixed at 10 km/h overspeeding. In order to change the value go to Menu > Settings > Alerts > Speed penalty. When driving NAVITEL® GPS navigators display the route covered and left to the destination point. The green cursor is sliding along the progress bar in order to indicate the distance left to the final point. Not only can the user check the time left, but also the distance to it. What is more, Navitel Navigator update includes: indication of navigation in tunnels and an extensive list of new branded POIs (petrol stations, ATMs, shops, cafes, etc.). To download the update please use our free utility Navitel Navigator Update Center for Windows. With this tool you are just a few clicks away from installing the new software version, maps, and the SpeedCam database. Please read the full instruction on our website.